Beauty Professor: Favorite Products for the Month of May! 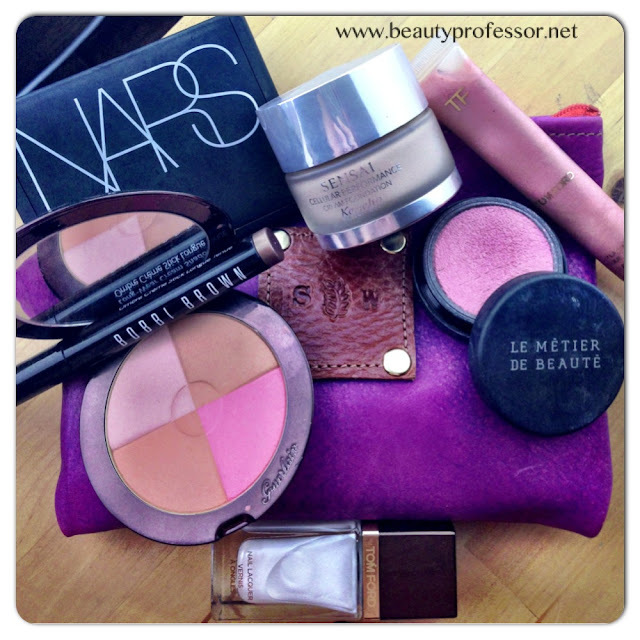 Above: My favorite products for May (Revlon Pink Cloud not pictured!). What are some of YOUR favorite products for the month of May? I'm a new follower of your blog, and I love your posts :-) Can you share how you think the Kanebo foundation compares to the Le Metier you raved about (I believe last year)? I'm looking for something that has medium coverage and a natural finish, but that lasts through the day and doesn't get shiny. Also, where do you get Kanebo? I've been googling, but can't seem to find any US-based stores that carry it. Thanks for following...I am so glad you found your way here ; ) Both the Kanebo and Le Metier Classic Foundation are superb...the shade range is a bit more extensive in the LMdB but I would say that the Kanebo has a slight edge in the lasting power department. The Kanebo is inherently glowy once applied, but it is different that appearing "shiny." I just touch up with powder and I am good to go. I get the Kanebo at Neiman Marcus...it is not online, but you can get it at most NM Kanebo counters (you just may have to call a store directly!). I hope that helps...full Kanebo review soon! Gah, sadly none of the department stores in Chicago seem to carry it :-( I'll wait for your full post and see if I can find someone to order directly from! Tragic!! The full post should be up later this week (before the weekend, crazy-end-of-the-year-teaching-schedule-permitting!) and hopefully that will aid in your decision! Sorry for the endless stream of questions (and thank you for being so helpful!) --any thoughts on how this compares to the SKII foundation you posted about earlier? I've been on a hunt for the "perfect" foundation lately, and have so many lemmings thanks to your blog! Never ever apologize for questions and comments...those are the best parts of blogging in my opinion! ; ) I do think that both the Kanebo and SKII foundations are on par in terms of quality and ingredients and medium to full coverage. However, the Kanebo has a dewier, more skin-like finish (which blends into the skin effortlessly while still providing great coverage) while the SKII is quite matte (still very pretty, but more of a typical foundation-like finish). I hope that helps...hoping to get the full Kanebo post up tomorrow! Happy to help ; ) I do get decent lasting power from the SKII, as long as I don't over apply it... the demi-matte finish on this formula is lovely. I do like the Face Atelier...I find the lasting power on this formula is enhanced in dry weather (I wore it for a week in the desert on vacation and never really needed to touch up!). Humid weather seems to bring out the major "glowiness" of this foundation and really compromise its ability to last over six hours. Truly, the Kanebo's lasting power, along with the Hourglass Immaculate, is significant and second only to Revlon Colorstay Whipped (a great drugstore option but no skincare/treatment ingredients). So I went to Saks and tried the SKII--really liked the finish, but sadly the lasting power wasn't quite up to snuff, and the color was a little off. I think I'm going to take the plunge and just order the Kanebo from the Beverly Hills NM (loooooved your review of that one--especially the comparisons to other foundations!). I'm having trouble guessing at my color, though, and was hoping to get your opinion. I have light/medium skin, and generally favor neutral to peachy undertones, despite being asian (anything with too much yellow tends to make me look ghostly--MUAs at stores kept giving me the yellow-based foundations on account of my race and I didn't catch on until a couple of years ago that I don't actually have really yellow undertones!). I tried the SKII in 330 (420 and 440 were too yellow for me)--the undertone was great, but the color was a little light. I think the Armani Maestro in 5.5 and By Terry in No. 9 have worked pretty well for me, although I am getting a tad more tan now that it's summer. Any thoughts on which color would probably work best for me? I thought warm beige might be it, but couldn't tell if it would be too pinkish. Thank you so much! You are the absolute best! Thanks for the update...I am so excited that you may try the Kanebo! In terms of shades, I am guessing that you would like the Warm Beige...it is warm and peachy, rather than pure yellow in tone but it is a bit darker than Natural Beige. If #9 in By Terry is working for you, then Warm Beige sounds like a wonderful prospect! I hope that helps...as always, take care and do keep me posted! Your reviews are so helpful! Do you have a favorite cream shadow stick line? I really love Laura Mercier's Caviar Sticks, but they are a little heavy and not the easiest to blend. I just ordered the By Terry Ombre Blackstar in Misty Rock after Google brought me over to your blog--can't wait to try it out! I've yet to try BB's shadow sticks but they don't sound as promising as the By Terry line. Hi Jillian...thanks for your comment!! I really love the By Terry Ombreblackstars above all else...they are extremely pricey, but their silky application and long wearing, crease-free formula cannot be beat! So glad you ordered Misty Rock...can't wait to hear your thoughts! Thank you so much for responding! You've got such a wealth of knowledge-- I really appreciate your input and I'm even more excited to get "Misty Rock". From what you've said, "Bronze Moon" will be on my shopping list too. My pleasure! Thank you for the sweet compliment...I am happy that my makeup addiction can serve a useful purpose ; ) Do keep me posted on Misty Rock and I highly recommend Bronze Moon...such a gem! You said the Kanebo foundation is making it into your top 3. What are your other favorites? Hi Kath! Thank you so much...the Kanebo is treat, indeed! The LMdB tint looks gorgeous!! As cream blushes go, the LMdB is my favorite, hands down! Hello dear Lynn! Thank you...happy you like ; ) How was your week? So glad you got the numbering/shade selection worked out with the LMdB foundation...I had a hunch you would love #7 and good to know that #5 is great for the winter months (that is likely my match for that season as well). Hoping to finalize my Kanebo post tomorrow...free time for blogging has been severely compromised this week as I wrap up the school year and all that entails! It is a crazy time, indeed! I can definitely see the light at the end of the tunnel, as my last teaching duties conclude next Thursday. Then, off to Tucson, AZ on a trip with my husband...he has business, I'll have a bit of pool time ; ) I can only imagine how involved changing salons much be...transporting all of your tools, re-establishing clients, getting comfortable in a new environment etc. I think I know which Benefit concealer you ordered...it is the one with the concealer core and gel-like substance around it!? I have read a couple of favorable reviews of it and hope it does the job for you! I have really been liking my Armani Maestro Eraser concealer (perfect under the eyes)...it is much less expensive than the Cle de Peau and LMdB Peau Vierge concealer but does a good job of handling the orbital area. Hope your weekend is wonderful...xoxo and talk soon!